(Bloomberg) -- The U.S. Transportation Department is creating a special commission to review how newly designed aircraft are certified, spurred by criticism after two deadly crashes of Boeing Co.’s 737 Max. The commission will evaluate how the Federal Aviation Administration oversees the process of reviewing and approving new plane models, including the government’s growing use of aircraft manufacturers’ employees to sign off on designs. The FAA joined other global regulators in grounding the 737 Max family of jets on March 13, after evidence surfaced linking the two fatal incidents. 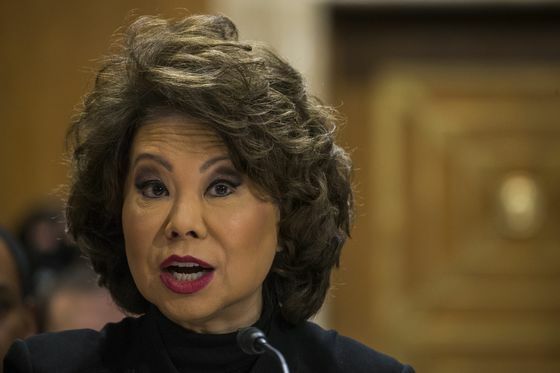 “Safety is the number one priority of the Department, and this review by leading outside experts will help determine if improvements can be made to the FAA aircraft certification process,” Transportation Secretary Elaine Chao said in a statement. The new review adds to the stepped-up scrutiny of the 737 Max as Boeing works with airlines and regulators this week to prepare a software update for the workhorse jetliner. A criminal investigation led by the Justice Department is also underway, as is an audit of by the Transportation Department’s inspector general of the 737 Max’s approval. The Senate is holding a hearing Wednesday to review aviation safety in the wake of the two crashes. Two 737 Max 8 jets have fallen out of the sky in the last five months, killing a combined 346 people. On Oct. 29 in Indonesia, a safety system on a Lion Air plane was continually pushing the aircraft to dive as a result of a malfunction. The Ethiopian Airlines jet that crashed in Ethiopia on March 10 behaved similarly, according to local officials, but few details about the investigation have been released. The Special Committee to Review FAA’s Aircraft Certification Process is an independent body that will present its findings to Chao and the FAA. It is being operated under a newly created advisory panel on safety oversight and certification, which was ordered by Congress in a law that passed in October. Retired Air Force General Darren McDew, who oversaw the U.S. Transportation Command, and Lee Moak, a former airline pilot who was president of the Air Line Pilots Association union, were named as co-leaders of the commission. Separately, Boeing has asked airline owners of its 737 Max jet to submit orders for a free update of anti-stall software being readied for deployment, in a sign that regulators are closer to approving a proposed fix that could get the planes flying again. Boeing is hosting customers and regulators this week in Renton, Washington -- home of the company’s 737 factory -- to explain the measures it’s taking to return the Max to service. The Federal Aviation Administration hasn’t certified the software change, the agency said in a statement. While the FAA has worked closely with Boeing during work on the update, it is waiting for the company to finish it so it can be reviewed. The redesign, which can be installed on a plane in as little as one hour, will bolster stall-prevention software to make it less likely to accidentally activate during normal flight. The software is known as Maneuvering Characteristics Augmentation System, or MCAS. After the update, the MCAS will rely on data from two angle-of-attack vanes, which measure the pitch of the nose against oncoming wind, rather than from a single sensor as is the case now. Boeing will also activate a cockpit display that shows pilots if the two vanes provide conflicting data, as they did on the doomed Lion Air plane. Once the software is approved by the FAA, it will be mandated, the agency has said. While Ethiopia and other nations aren’t legally bound by FAA orders, other regulators typically follow the FAA’s lead.